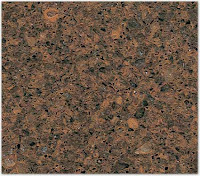 The furniture maker had pre-selected another quartz sample for me, it's pretty close to the Caesarstone Copper Canyon: Camarthen Brown by Cambria but they don't have any in stock and it might take three weeks to get a piece unless they can find an offcut from somewhere. Choice #3 would be Silestone Mahogany, which is a little too terracotta or Kona Beige, which would mean going in a totally different direction. I've ordered the Cambria and asked them to rush it. Fingers crossed. And on another tack, the landscaper informs me I have a break on the sprinkler line just where he's planting. That's the sprinkler line the guys fixed two weeks ago. It seems like everything that could go wrong is going wrong this week. I don't think I'm going to answer the phone or pick up anymore emails today because I can't cope with any more bad news at the moment.